One of the many Vetter copies that appeared. 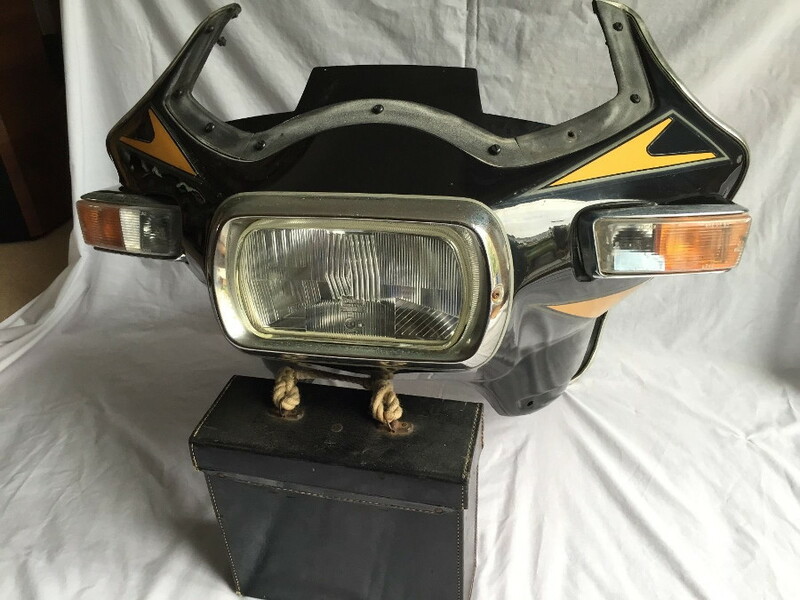 I wasn't going to bother getting it, as I thought that headlamp would be hard to get now, if it needs replaced, but it turns out to be still available; and cheaply, too. The reflector area is just about the same as having two 5.25" lights, and a decent quality LED H4 in that will light up the road pretty well. I recall these exact lamps being fitted to various Renaults in the 70s - they weren't bad at all. Not wildly keen on the 70s colours, but a pot of black paint will sort that. Copying is the best form of flattering. Craig should be flattered more than most. I like the head lamp. That is definitely its own twist on the Jammer. Kinda exaggerated lines. I dig the signals, and the HUGE headlight. I have not seen one of these on US eBay. However I do not prowl that often for non-Vetter stuff. Every once in a bit I do look for Howe stuff. Yeah, now that I've confirmed the headlamp, the signals are still a bit of a mystery, but they ring a very strong bell with me. I'm sure they were off a 70s Simca or something. If there are numbers on the indicator lens you may be able to find a match for them by searching the part number on the net. 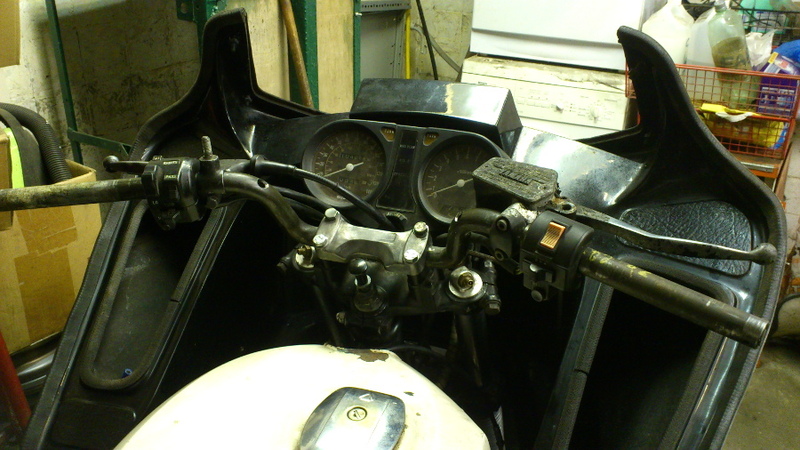 I matched a set of indicator lens for a twin headlight Rickman Polaris using the Lucas numbers to a 1965 Thriumph 1300. Good idea - the classic car clubs have put all sorts of stuff up, too. Skidmarx have a 'Vetta' screen listed - also one for the Pantera 2, which is handy. I might resort to buying one in the end, but there's a very good stockist of Lexan near me, who is extremely cheap for the 1/8th" and 3/16" grades, so I'll be DIY-ing it first. Cleaned up my old screen, not perfect but will do for now, the Windjammer SS I have has got the chrome trim which fits around the bottom of the screen and uses the top 2 bolt holes to attach, I believe the later Windjammer screens have clips in this position. I had a friend many years ago that had a Pantera 2 fitted to his Ducati 860 and had Vetta top and side boxes, he went all over europe with that bike so I believe it should be good, they were British made too! Classic car clubs may be able to help with the parts, the single headlight Rickman Polaris uses old style Jaguar indicators again by Lucas, the headlights on the Polaris twin are a Hella part for an old VW originally. Good luck with your search. These look like they'd do, if they're close in size. Not hugely expensive, either - and they have repros normally in stock, which will be cheaper. Unlike some of Holden's stock, which are eye-wateringly expensive. Which is handy, as I'll need a 7" H4 main light from them anyway, for the WJ IV. I thought they stocked Autopal, but they've got Lucas and Wipac Quadoptics, which will do fine. There is a pair of new ones on eBay delivered for £25.95 here. Looks like I'll be sorted for spares all around, assuming the Lucas ones are near the size. I've been looking up Cibie Z-Beams in 7" - they used to be top of the heap and it wasn't too long ago good used ones were figuratively ten a penny - now they're going for stupid amounts of money for a matched set. At the moment there seems to be no real shortage of NOS Continental ones, but left-hand-dips are scarcer every day. There are fakes and 'repros' that aren't worth a light, of course. Well, this thing arrived today, and several points of good news related to it. Firstly, it's more than just a cheap copy, it's very well made and probably wasn't all that cheap when new. The headlight is a Cibie, a detail I'd forgotten about on those Renaults that used them; the sidelights are Lucas and probably still available; the missing fairing lid count has been reduced by one, as a lid was stuck up inside the body of it; it's actually deep gloss black with goldreflective panels, and not horrible 70s dark chocolate brown with yellow; it's got a built-in radio hump, just crying out for an 8-track to keep in period (nah, I wouldn't do that to it). What no 8 track??? Love those radios I have several. Sat it on the Vetter bracket - perfect fit, which is no surprise. 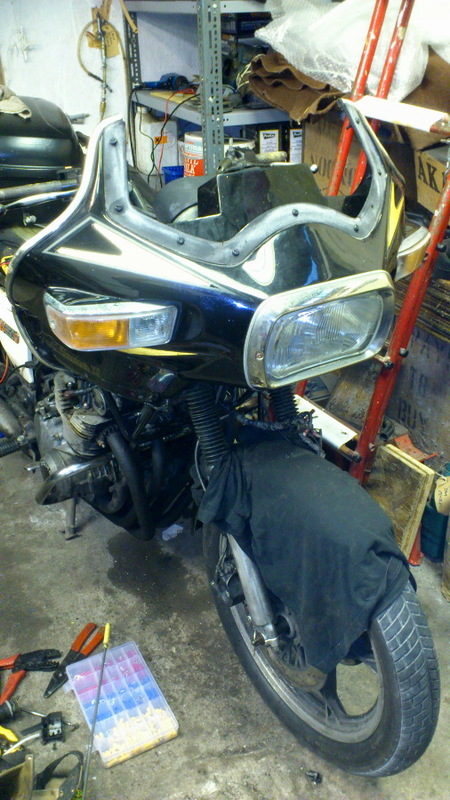 I've decided to fit this one on the '80 GS, as that's the Winter Workhorse and good lighting is a must on that. The WJ can go on the other, '79, GS when it goes back on the road. It was this that persuaded me... The 200mm rectangular (this one) has nearly a mile range. Dave, that looks super cool. I like the headlight shape. 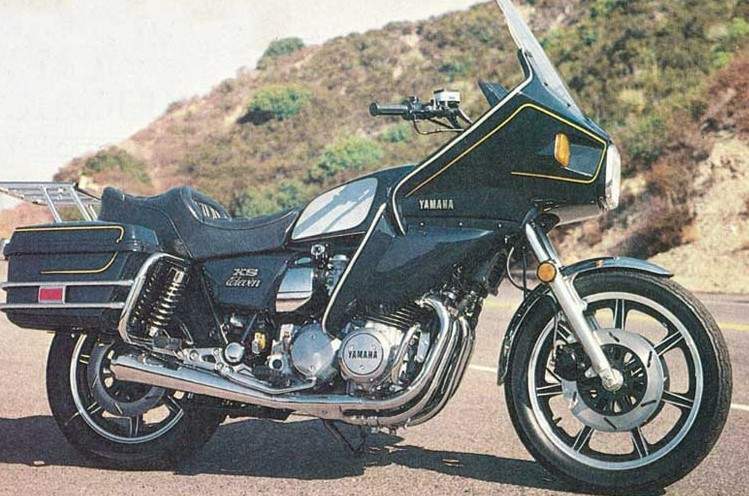 Now that I've decided to stick with my original plan and fit the WJ IV to the GS, and the Pantera 2 to the XJ9, I was casting around for similarly-faired Yamahas, and came across the Venturer of 1980. This wasn't one that was sold (or very few) this side of the Atlantic, so it had slipped past me. However, I'd not be at all surprised if more than one Pantera was fitted to an XS11, back in the day. 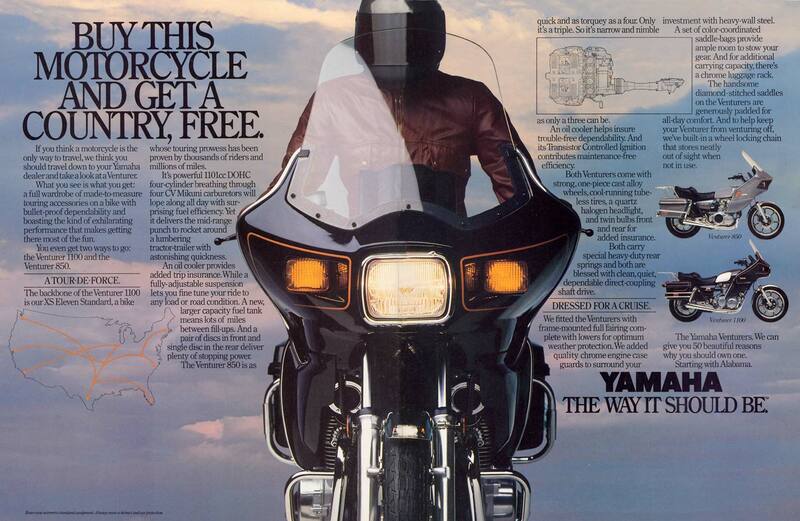 In a way, it's a re-make of history - this is pretty much a copy of a Vetter, and the original Venturers were fitted with post-Craig copies by Vetter.Inc, at Yamaha's request. Looks to me like they used the WJ SS / IV as a base, and not the WJ V.
So, I'll be creating my own, slightly down-scaled version of a Venturer - A Venturette, if you like. A Venturator? If you click on the advert, you can see the front mudguard is definitely askew. I don't think the photographer noticed that. I've just found the first pic of one in the wild - pretty sure it's on an XS11, too. It's obviously a despatch bike of around the late 80s, early 90s, and that logo on the bike in the background is hauntingly familiar. That is definitely a despatch company yard. The big old nails that were ex-tourers often bought and pressed into service as long-distance despatch hacks, plying the motorways of the UK, at 30p per mile one way. I did eventually find a use for my Pantera I fairing when I could not locate a suitable screen, hope yours works out better! Hah; well it'll be going on the XJ sometime over the winter and no flower pots involved. I was kind of right about that pic of the XS11 - that's a still from 'Boon' and the fictional Texas Ranger despatch company. 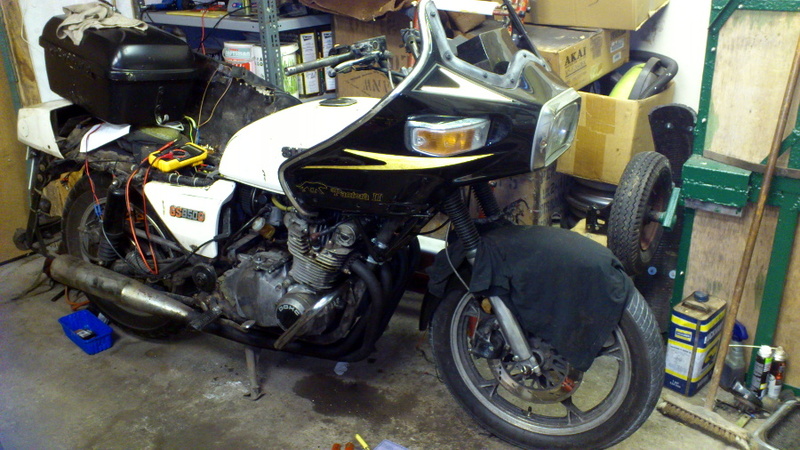 However, the bike in the pic did exist and probably acted better than most of the cast.